• Wide range of connector and cable types available. • Interferometer report also available. The FastFibre range of re-deployable Pre-Terminated assemblies can be supplied on a wide range of reel options, which are featured in this section. We have the capability to bespoke a solution to meet your requirements, please contact us for more detail on this.is. Our Fast Fibre range of deployable assemblies, are designed for applications that require up-to 8 fibres, with an optional mesh pulling sock for indoor or light outdoor applications. Supporting connector types are SC, LC ST as standard. Other connector options are available upon request. Optional extras include a heavy duty/ rugged pulling sock, optimised strain relief and fibre optic clean kit. FastFibre Plus range of re-deployable assemblies, are designed for applications that require up to 24 fibres, with a optional heavy duty/rugged pulling sock or mesh pulling sock for indoor or light outdoor applications. Our re-deployable range of Pre-Terminated solutions can be supplied on Mil-Tac cable which is extremely strong, lightweight yet rugged. Mil-Tac re-deployable solutions are suitable for broadcast, military tactical field use and as well as industrial, mining and petrochemical environments where retrieval and re-use is a requirement. A optimised strain relief is supplied with all heavy duty / rugged pulling sock. The heavy duty sock incorporates a protection. 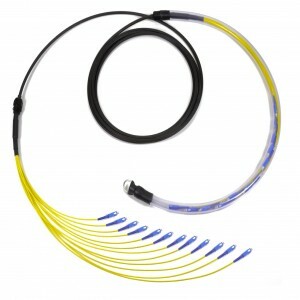 A fibre optic clean kit is available to ensure your connection remains clean and dirt free.